An interview with MARK CHILDRESS, prolific Southern novelist, who talks about hanging out with Jorge Luis Borges, Thelma Toole, and Chef Paul Prudhomme. Monroeville, Alabama must have story-telling elixir in its water table. Truman Capote summered there and the town gave birth to Harper Lee (To Kill a Mockingbird) and Mark Childress. A former part-time New Orleans resident, Mark has written the novels A World Made of Fire, V for Victor, Tender (named to several Ten Best of 1990 lists), Crazy in Alabama (made into a movie by Antonio Banderas with Melanie Griffith), Gone for Good, and One Mississippi. His articles and reviews have appeared in The New York Times, Los Angeles Times, The Times of London, San Francisco Chronicle, Saturday Review, Chicago Tribune, Philadelphia Inquirer, Travel and Leisure, and other national and international publications. His new novel Georgia Bottoms appeared in February to strong reviews. Q: You live in Key West now, having sold your New Orleans house right before Katrina. You wrote a terrific piece in Salon called “Disaster Tourism” about the danger that “the country was ready to begin turning its back on the whole thing” and recounting your first return. The piece ends, “Maybe New Orleans will be okay after all.” You’ve been back since? What’s your take now on New Orleans’ return to form? A: I’ve been back to New Orleans a dozen times or more since Katrina. It has been amazing to watch the city go from dead to barely alive to beginning to thrive again, although it still feels largely depopulated to me in certain districts. Considering the paucity of effective local (or national) leadership at the time of the storm, I’d say the residents of NOLA have done an amazing job of climbing out of the hole they found themselves in. Some things came back faster than I would have imagined at the time – the restaurant scene, tourism, violent crime. And some parts of New Orleans are just dead or still mostly dying. My biggest fear, of course, is another storm that will demonstrate that the Corps of Engineers’ attempts to improve the levee system have been piecemeal and half-hearted. I still don’t understand how America’s most important port city can be left exposed in this state of long-term, extended danger, and nobody outside of New Orleans seems to feel any urgency about it. To me, the entire response to Katrina was a failure of our national will. Q: How long were you a part-time resident? What do you miss about New Orleans? A: I’ve been visiting New Orleans regularly since I first made several pilgrimages as a college student in the 1970s. During the 1980s when I lived near Mobile, I was here all the time. Finally I bought a place here in 2000 and sold it in 2005. When I’m not here I miss everything about the city – the sounds, the smells of (most of) the streets, the heavy air coming in off the river, the way everybody calls you “baby.” I know it’s a cliché to say The Food, but how can you not? I tend to be fat anyway; this city encourages me in this. When I am here, I don’t miss the storm drains that turn into lakes at each corner when it rains. But then, we have those in Key West too. Q: Your work has often been characterized as Southern Gothic in the tradition of Flannery O’Connor and those other southerners, Colombian Gabriel García Márquez, and the Argentine writer Jorge Luis Borges. How does your experience of New Orleans relate to those traditions — Southern Gothic and Magical Realism? Did New Orleans help feed those grotesque juices that seem to flow through your pen? A: Well, and don’t forget our local New Orleans master and wizard, John Kennedy Toole. My most recent novel Georgia Bottoms is partly inspired by A Confederacy of Dunces. I decided to try to take on the same challenge Toole set for himself: to create a lead character who is unsympathetic in every possible way and make the reader fall in love with her. For Georgia, my character, New Orleans represents an almost impossibly rich and unattainable fantasy. She has spent her whole life in a little Alabama town, scheming and dreaming of a way to get to New Orleans. My theory is that modern New Orleans is a city dedicated in every way to a celebration of decay. This makes it unique on the continent. It’s the only American city that actively and ritually acknowledges the existence of death, through the Carnival. It’s the most Gothic, the most exotic city in America. Where else could Anne Rice have placed her vampires? Brooklyn? Philly? I don’t think so. I find myself following in the footsteps of Tennessee Williams. I have now lived in most of the places he lived. He had excellent taste in places to live. Q: You grew up partly in Ohio. I'm going to guess you don’t miss too much about Mid-West cuisine (like “meat and 2”). Given a long weekend in New Orleans, where would you eat? A; Oh God, anywhere they would have me. Bayona, Galatoire’s, NOLA, K-Paul’s, Casamento’s, the Rib Room, the Upperline, Commander’s Palace, Arnaud’s, Acme Oyster Bar, Restaurant August, Bouligny Tavern, Brigtsen’s, Stanley and Stella!, maybe a muffuletta from Central Grocery,…. Do I have to stop? A: Back in the mists of time, when I was a young editor at Southern Living magazine, they sent me to New Orleans to do a story on this hot new cuisine everybody was talking about: the “new Cajun” as exemplified by Paul Prudhomme. This was the moment when people were lining up around the block and waiting three and four hours to eat at K-Paul’s. I mean, Paul kind of invented modern foodie New Orleans with that restaurant. me and our photographer, Mike Clemmer, on a tour of Cajun country. We ate from morning to night. Paul’s old auntie cooked us eggs at dawn, then we went off to little stores in the back towns searching for homemade boudin and rabbit stew. Everywhere we went, of course, he was The King, the local boy who was making the big time, and the local people pulled out everything good they’d ever cooked and made us eat it with them. Everything I know about Louisiana food, I learned that week from Paul Prudhomme. Another memorable evening brought about by Southern Living was the night I took Thelma Toole out to dinner. Thelma was extremely peculiar, exactly like the character of the mother in A Confederacy of Dunces. I had spent the whole day with her, trying to cut through the overwrought dramatic monologue and get her to tell me something true about her son Kenny. God, I do love that city. An interview with BETTY FUSSELL, renowned journalist and author of books about American food and culture. Betty Harper Fussell writes big, virtually encyclopedic books about food like The Story of Corn, an in-depth study of the plant as a crop, religion and culture. Among her other 10 books are I Hear America Cooking: The Cooks, Regions and Recipes of American Regional Cuisine, Raising Steaks: The Life and Times of American Beef, and My Kitchen Wars, a portrait of her decades-long marriage to literary critic and military historian Paul Fussell – and its breakdown. My Kitchen Wars became a successful off-Broadway play. Q: Thanks, Betty, for sharing your thoughts about New Orleans and food culture. We’ve spent some time together in New Orleans. You’ve been coming here for a long time – what are some of your favorite New Orleans restaurants and foods? What restaurant do you most miss? And what is your favorite dish at Jazz Fest? A: My number one favorite—the one and only DOOKY CHASE’S [2301 Orleans Ave—5 blocks from the former Ruth’s Chris flagship], with the incomparable, unconquerable Miz Leah. After that, you just go crazy trying to name all the places you love. But let’s have a go: The Ruby Slipper [200 Magazine Street ] for breakfast; Crescent Pie & Sausage Co. [4400 Banks Street] for a midmorning snack; Bourbon House for a shot and a plate of pre-lunch oysters; drop into Cochon for a po’boy; then a big bowl at The Old Coffeepot gumbo shop [714 Saint Peter Street]; then maybe Café Amelie [912 Royal Street] for a Satsuma cocktail; and is it too late to go on to brunch at Commander’s Palace [1403 Washington Avenue]? Or should I start lining up for Galatoire’s [209 Bourbon] for an early dinner or call Miz Jessica to see if she’s going to be at her table? Or call Miz Daphne to see if she’s dining at any of Emeril’s restaurant collection? Or just run over to Mandina’s or….or….or…. Camelia Grill [626 S Carrollton Ave] or Casamento’s [4330 Magazine St]? It’s not even midnight, where shall we go for Sazeracs and jazz? Wait a minute, I forgot Jazz Fest. But Miz Poppy didn’t forget that shaker of daquiris to drink while we stand in line for soft-shell crab po’boys and beer. Q: I once heard a New Yorker’s response to Galatoire’s: in New York everyone would have an eye cast over their shoulder to see who was to be seen and who was seeing them, while in New Orleans the mind stays steadfastly at the table, on the food and on the conversation. (Of course the conversation is probably about the last great meal or the next). How do you compare the experience of New York and New Orleans tables? A: It costs more in New York. Eight million people on a rock, go figure. New York is about cost. Not food. Rather, there’s nothing in the way of food that you can’t buy in NY, you just have to pay for it. A $500 meal for one at Per Se is about the money. Of course the food is fabulous, but that’s not why most of the diners who are there are there. Every bite of food has to brought in to the Rock, by car, boat, truck, train, plane. That’s going to cost you before you’ve even lifted your fork. New York is a port, like New Orleans, but it doesn’t take a social scientist to see they‘re not comparable in any way, except that both ports attracted a lot of different kinds of immigrants who brought with them a lot of different kinds of tastes. Vive la diffèrence. Q: My memoir owes an epigraph to you: “Steak for all of us immigrants means America.” In Raising Steaks: The Life and Times of American Beef and in The Story of Corn you are interested not just in the history of food but also in the mythic, almost spiritual experience of food. Is there anything special about New Orleanians’ spiritual or mythic relationship to food? We do after all worship the fatted calf (le boeuf gras) on Mardi Gras. A: Heavens to Betsy, New Orleans is entirely a mythic experience, a spiritual boom-box. It’s the only place I know where music is the heartbeat, the footbeat, the gutbeat of everyday life every single day, not just on feast days. That’s why I try to come every year to the French Quarter Festival, when every street corner has a trumpet and a tap dancer and the zydeco tent is booming dawn to dusk with bigbellied oldies twirling their partners. That Festival, the last free one in America, just condenses what’s already there. In New Orleans music is not just the food of love, music is FOOD and food, music. Ask anyone. Q: Raising Steaks is in part about what went wrong with American beef. What’s going right and where can we get some of the best beef available today? Do you seek out dry-aged beef for your table? Corn- or grass-fed? Do you seek out the little producers who sell at farmers markets? (I hear you are old friends with Justin at the Crescent City Farmers Market — is there a story there?) Do you order over the internet? A: Yes, yes and yes. Wet-aged is an oxymoron designed by commodity meat producers to prolong shelf-life etc. through an airless CryoVac seal. Dry-aged requires air (oxygen) to change the enzymes slowly and transform layers of taste. Dry-aged is about FLAVOR. The industrial meat boys hate dry-aging because the beef loses weight while it ages, demanding time and space. Not just grass-fed but grass-finished is the key to genuine pastured, cared-for beef (and other red-meat animals). Grass all the way – check out the American Grassfed Association. Of course that means, in an industrially-scaled context, small guys who sell either at farmers markets or online direct or sometimes, now, to a national specialty chain like Whole Foods. Will Harris in Georgia sells his grass-finished processed on-site cattle to the southern region of Whole Foods. Before my local farmers market at Union Square in Manhattan began to sell beef, I bought a lot online. As the green movement picked up speed across the land, even fancy but still family-owned butcher shops like Lobel’s on Manhattan’s Upper East Side have added an online distribution. At Union Square’s Greenmarket, I can now buy really good beef from a number of Hudson Valley ranchers –– and more are on their way. Go Green, says I, echoing Justin Pitts at Crescent City Farmers Market. I met him first at an annual Heritage Breed (American Livestock Breeds Conservancy) conference in the pinewoods of northern Florida, where I also met my first Pineywoods cattle. Justin is an outstanding overall – and overalled – icon of all that is good in the care and feeding of heritage breeds. As for stories, I hope Justin is recording them at this very moment for posterity. Q: My mother didn’t often say it in public, but in her own account, the best steak she ever had was on her honeymoon in Buenos Aires. Yet, in Mark Schatzker’s Steak: One Man's Search for the World's Tastiest Piece of Beef, we hear that even Argentina is following our lead in ruining beef with corn feeding and massive dosages of antibiotics in overcrowded feedlots. If you could get on a plane tomorrow and were carrying a big appetite (and fat pocketbook), where would you go for a great steak? A: Drat it, I’ve never got to Argentina. Always wanted to tango in Buenos Aires and run up north to a finca and flirt with the gauchos. I think Argentina has now become the number one global exporter of beef, and such volume almost automatically means commodity-breed cows finished on corn in big feedlots and processed in big volume for distribution. I cry for you, Argentina. And even more for Brazil, who’s moving ahead fast in cutting down the Amazonian rainforest to plant corn to feed to cattle and other livestock. The US has done a great job of exporting its industrial model to the rest of the world. Was that a good idea? New Orleans with its oil spill knows the cost of that model more directly than most of us. I think your mama’s honeymoon in Buenos Aires was a long time ago and I’ve no doubt her steak dinner carried the rhythms of the tango. Today, for myself, I think I’d just hop across the East River to Peter Luger’s in Williamsburg, for a big porterhouse for two, served on wooden tables to the sound of big families with lots of kids clamoring for more. I would go alone and ask for a doggy bag for the bone. Eric Overmyer made a big splash in legitimate theater in the 80s with On the Verge and has since had a stellar career in writing and producing for television: Law and Order, Homicide, The Wire, and Treme. 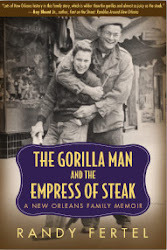 The last came out of his long-time, part-time residence in New Orleans’ Marigny district near the French Quarter and his long-time association with David Simon. Q: Eric, thanks for taking time out to share some thoughts about New Orleans. We’re thrilled that Treme is going to be here for a third season. What feedback on the show do you get from New Orleanians? Because it’s about them – as survivors of the trauma of Hurricane Katrina – do you find they nitpick the details? Do those viewers outside the region get it? How does their response differ from ours? A: New Orleanians tend to have an intensely personal reaction to the show, pro or con -- it's unlike any audience reaction I've ever encountered, which makes sense when you think about it. How many television shows have there been about a major catastrophe and its aftermath? Maybe none, other than Treme. Our non-New Orleanian audience (wherever they may be -- "New Orleanians" -- people from New Orleans, people with ties to New Orleans, people with affection for New Orleans -- I would call all of them part of our New Orleanian audience—and they're everywhere) I think experiences the show in a more ordinary way. They respond to the characters, the music and the depiction of the musicians, and the depiction, surprisingly, to me, of the food and the cooking and the restaurant world. And yes, of course, New Orleanians nitpick -- and offer definitive and often contradictory information about all and sundry. Imagine how many variations on the pronounciation of "Uglesich's" we were given. People nearly came to blows. Some New Orleanians don’t like the show at all. How dare we presume to tell ‘their’ story? Everyone has a Katrina story – even I do. My wife and daughters spent most of the summer of 2005 in New Orleans, suffered through Tropical Storm Cindy, which knocked the power out for a week in our neighborhood, and just happened to finally pack up and drive out of town on the Thursday before the storm, thinking it was headed for Florida, and so missed being caught in the nightmare of the evacuation. People are very proprietary about their storm story, and who can blame them? We have no ‘right’ – we weren’t here (although a lot of us were), we’re carpetbaggers, and so on. Those kind of folks, I expect, don’t watch the show, secure in their certainty that we couldn’t possibly get it right. Others just don’t think Treme’s very good. I was in the Louisiana Music Factory one day during this past Jazz Fest and one of the owners/managers (not sure which one, I wasn’t looking) in response to a question about slow sales of the Season One dvds, said, “Of course it’s not selling, it’s like a bad home movie.” I put back the stack of cd’s I’d been assembling, went to the counter with a token purchase and got out of there – and haven’t been back since. Which pains me, because I love the LMF. I just haven’t decided if I’m still a customer. It stung. The relationship between the show and its New Orleans audience is personal – and cuts both ways. Q: Even though you brought years of experience in New Orleans to the table (or writing desk), you hired New Orleans writers like Lolis Eric Elie and Tom Piazza. Have you learned a lot more about New Orleans since you began? Like what? A: I thought I knew a lot about New Orleans before we started the show, and of course I've learned a tremendous amount since about the city, its culture and history, and its politics. We had the good sense to hire Tom and Lolis (who sometimes disagree -- and I've had the very satisfying experience of knowing things they didn't know) -- and also consultants like Mary Howell, Jacques Morial, Donald Harrison Jr, Kermit Ruffins, Jordan Hirsch and so on – and they’ve been tremendous. Who I've really learned from are the musicians and Mardi Gras Indians we've worked with, and the local folks on the crew and the staff, people like Karen Livers who are makers of culture themselves. I think what I've learned that's most profound is what a small town New Orleans is, and how interconnected people are through family and friendship and work, and how thoroughly and devastatingly the Federal Flood ripped those relationships apart -- and how it is the culture that has partially restored and knitted them back together since. And I've also come to know how much I'll never ever know about the Indians. Q: Y'all have paid a lot of attention to getting New Orleans culture right. I think of the wonderful episode where you wove the three strands of Mardi Gras culture into a single braid: mainstream, black, and Cajun. Of course your trying to capture the different strands of our other sub-cultures — music, food, politics (and succeeding brilliantly). Why is it so important to you and David Simon to bring New Orleans culture to a wider audience? A: My wife and I bought a house here in 1989 and have been spending as much time as possible here ever since. We consider it our home. When I met David in the mid-nineties on Homicide, Life On The Street, we discovered we shared a mutual interest and affection for the city and its culture, especially the music (okay, and the food), and a mutual dismay at how it had been mostly portrayed in film and on television. (With rare exceptions like Les Blank’sAlways For Pleasure, and Kazan’s Panic In The Streets.) All of which naturally gave rise to questions like "Wouldn't it be nice to do a show and shoot the rest of the city, beyond Bourbon Street and the St. Charles streetcar?" and "Do you think it's really possible to convey the essence of New Orleans on film -- the way people act and talk, the way the city looks and feels and smells?" and, "Do you think anybody'd be interested?" I think the jury's still out on those last two questions. We've shot the city beyond Bourbon Street, and we've tried to convey something of its culture and sound and feel. I think you absolutely appreciate the show more if you're from here, or if you've ever been here, because so much of the experience of being here is unconvey-able – the light and the air and sounds and smells. I do know and have heard from people who've never been here that the show has captured their imagination, and makes them want to visit -- and New Orleans does that, sends out its scent over various breezes and lures people from all over the world. As we wrote in the very first episode, New Orleans lives in the imagination of the world. Why? A small, poor semi-tropical port city -- it's remarkable, the influence New Orleans has had on world culture. If only the "city" itself, the business-political-legal establishment, would look beyond the layer of tourism that feeds off the culture, and really pay attention to nourishing its roots so that it could truly flourish in the future as the city rebuilds. Q: Albert Lambreaux, the Mardi Gras Indian chief in Treme played by Clarke Peters, seems to be a moral center to the narrative. Tell us about your experience of Black Mardi Gras and of Tootie Montana, the chief of chiefs in particular. A: I only know Tootie through the great documentary you produced, Tootie’s Last Suit. We were in town the night he collapsed at the city council -- one of our neighbors called us and said turn on your television. It was a legendary, tragic moment -- and appropriate for Tootie, with his history and mythic stature. My own experience of black Mardi Gras is very limited -- I've encountered the Indians on Mardi Gras Day a few times, gone out on Super Sunday and St. Joseph's night. They're the most magical, mystical manifestation of New Orleans culture that exists -- and almost impossible to describe to someone who's never seen or heard of them. And it's been that way since early in the last century. Listen to the way Jelly Roll Morton talks about the Indians on the Library of Congress recordings – he gets all worked up. When the cry goes out, "Indians a comin, Indians a comin" , everyone gets excited. Q: Food and restaurants play a central role in the series. Why did you choose to do that? The shows also seem to pay a good bit of attention to the cultural differences between restaurants in New Orleans and New York. What are the most significant ones? A: Food is as important to the culture of south Louisiana as music, n’est-ce pas? They’re inextricably linked. (Along with drink.) Harder to convey on film, but we had to try, and we had to have a chef as a main character. As for the differences between New York and New Orleans food cultures, I’m sure we just scratched the surface, and I’m no expert – we were all guided by Tony Bourdain this past season, as well as a raft of other consultants, like Susan Spicer. The differences between the cities were only important as they were experienced by our chef in exile. Everything flows from the characters. Q: Toward the end of season two, Delmond Lambreaux’s quest to merge contemporary and traditional jazz seems a very loaded affair, a commentary on how far jazz today has diverged from its roots in African and in popular culture. You seem to be stirring the pot and I wonder if you’ve gotten any feedback from jazz musicians? A: I haven’t personally had any feedback – and again, this story arc emanates from Delmond’s character journey – which is rooted in his complicated relationship with his difficult father. We were also aiming to recreate Donald Harrison Jr’s wonderful and under-rated Indian Blues album. You ought ask Donald what feedback he got at the time he made the record, back in 1990’s. My understanding is that he did get some. We really weren’t aiming to make any big statement about modern jazz per se – at least I hope we weren’t – we’re not knowledgeable enough on the subject. Most of the time a character’s opinions are his or hers, not ours. That’s how it should be, anyway, in a drama. Otherwise, it’s an editorial. Q: And tell us about your favorite New Orleans food and music haunts? A: Where to start? Adolfo’s, Spotted Cat, Chickie Wah Wah, Tip’s, Parkway Bakery, Liuzza’s, Liuzza’s by the Track, Buffa’s backroom, Galatoire’s, Arnaud’s, Tonique, Coquette, Le Petit Grocery, Butcher, Stein’s Deli, Brigtsen’s, Meauxbar, 1179, Herbsaint, Bayona, and Uglisich’s (gone but not forgotten), dba, Maple Leaf, oh Lord, call 911 now.